On Device Research has recently published an interesting report on Mobile Malaysia: ahead of the pack. 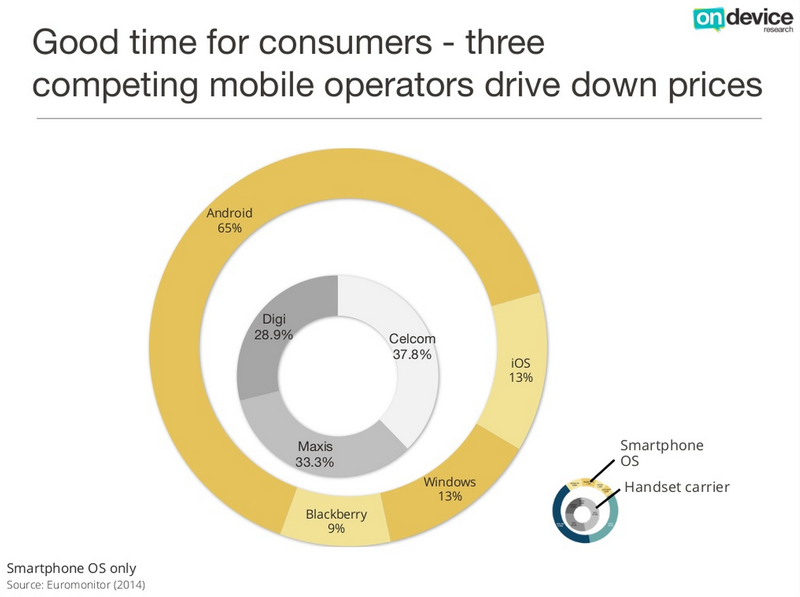 The report helps us to understand the mobile landscape in Malaysia, especially on smartphone trend. On Device Research has recently published an interesting report on Mobile Malaysia: ahead of the pack. The report helps us to understand the mobile landscape in Malaysia, especially on smartphone trend, and how does it imply to mobile commerce and mobile payment. 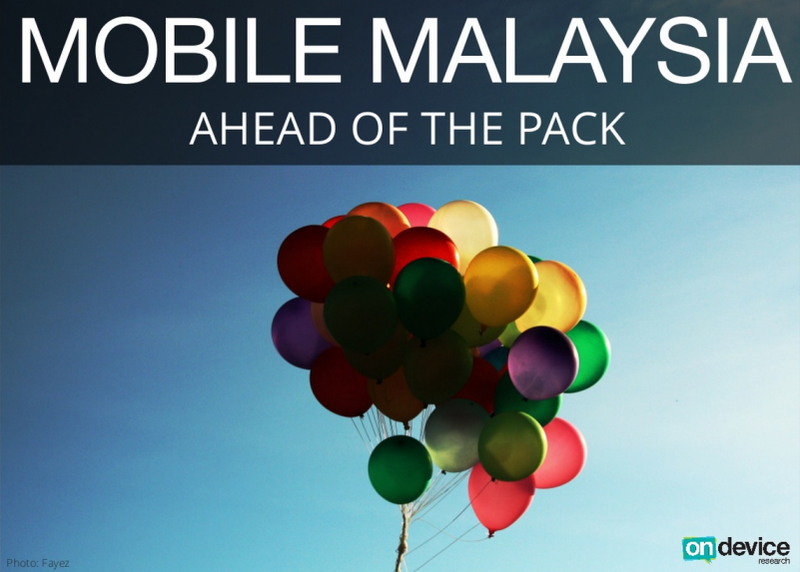 How does Mobile Malaysia be "ahead of the pack"? To our surprise (and possibly yours too), Malaysia fares better in mobile landscape compared to most Southeast Asia countries, and even United States! Read on to find out more about "Malaysia Boleh" in the mobile arena. 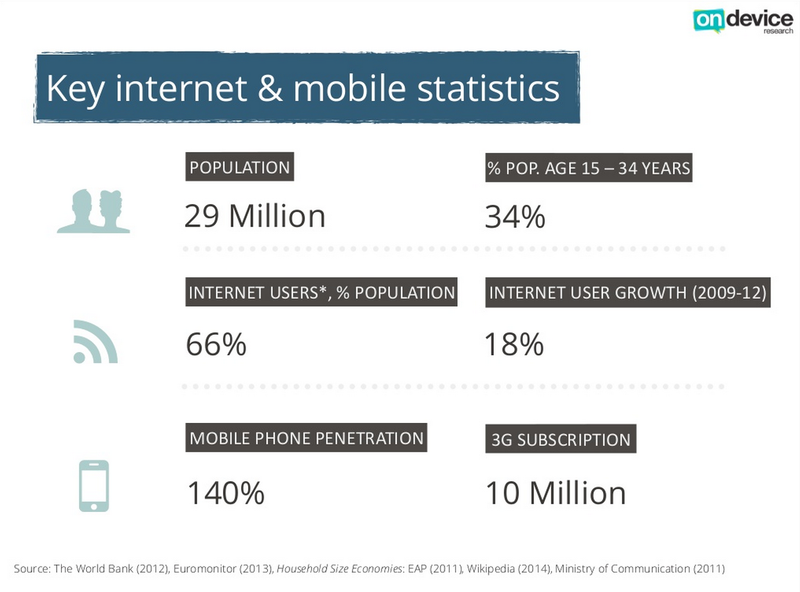 According to World Bank, Malaysia with 140% mobile penetration is leading Indonesia, Thailand and even United States! Only Singapore and Vietnam in Southeast Asia have higher mobile penetration than Malaysia. Our report earlier shows 27% of smartphone penetration but the latest data stands at 35%, which means there are more than 10 million smartphone users in Malaysia. 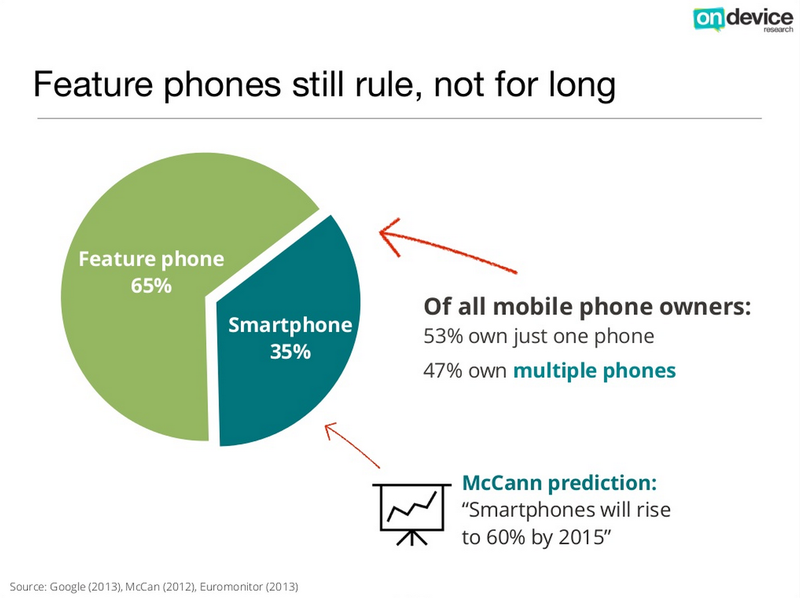 McCann even predicted that smartphone penetration in Malaysia will rise to 60% by 2015. On Device Research has also presented a breakdown of smartphone OS in Malaysia, with Android the majority 65% followed by iOS and Windows with 13% respectively. Due to the fact that 3 major mobile carriers in Malaysia are competing with each other in customer acqusition, affordable smartphone plans are the major factors contributing to the smartphone adoptions. According to Nielsen & PayPal Analysis, e-commerce market size in Malaysia was supposed to be RM 3.65 billion in 2013, including the transactions of both services and products. If we refer to Euromonitor's report, RM 1.24 billion (or 34% of PayPal's report) are products-only transactions. Nielsen-PayPal reported RM 1.82 billion of mobile commerce in 2013, which represents close to 50% of total e-commerce market size. 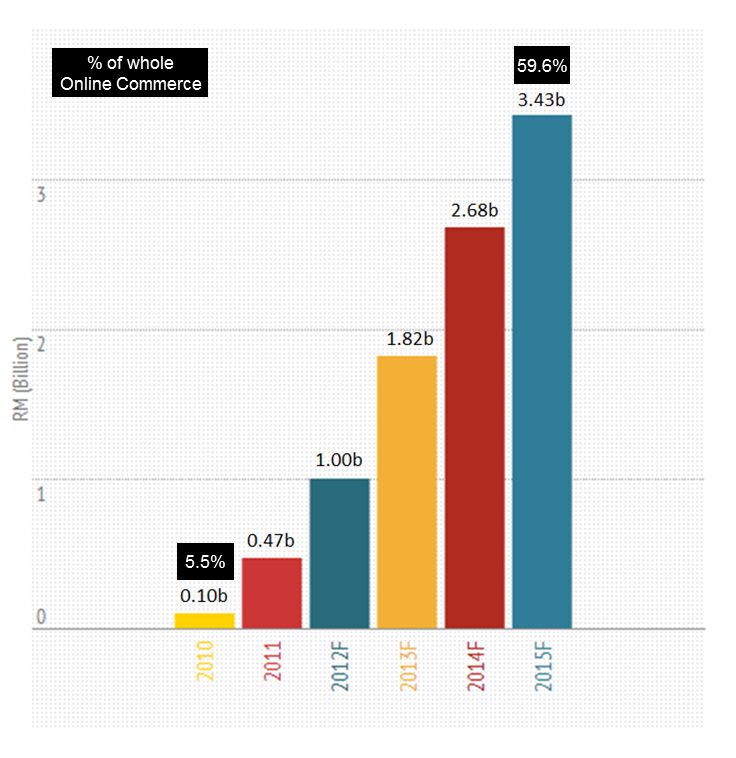 Interestingly, mobile share of online commerce was only 5.5% as recent as 2010, and it is projected to reach 59.6% in 2015. Next, what do Malaysians purchase on their mobile devices? 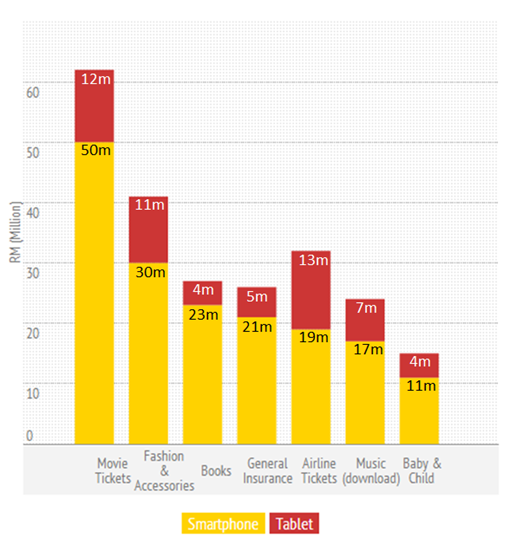 As expected, movie tickets are the main driver for smartphone purchases followed by fashion & accessories, while airline tickets are the most popular items Malaysians purchase on tablets. Since movie tickets are the most popular items Malaysians buy on smartphone, let's take a look at what kind of mobile payment methods accepted by the leading cinema in Malaysia - GSC. If you refer to the screenshot above, GSC only accepts M2U, RHB (both online banking) and PayPal. We personally think PayPal provides the best user experience in m-payment, as compared to online banking which requires Transaction Authorisation Code (TAC). As per our analysis of top online payment methods in Malaysia, only 12.5% of payments here are going through PayPal, Cash, COD, Celcom AirCash etc. Plus, there are only a few hundred thousands of PayPal users in Malaysia. This reflects the reality of lack of strong mobile payment services in Malaysia. 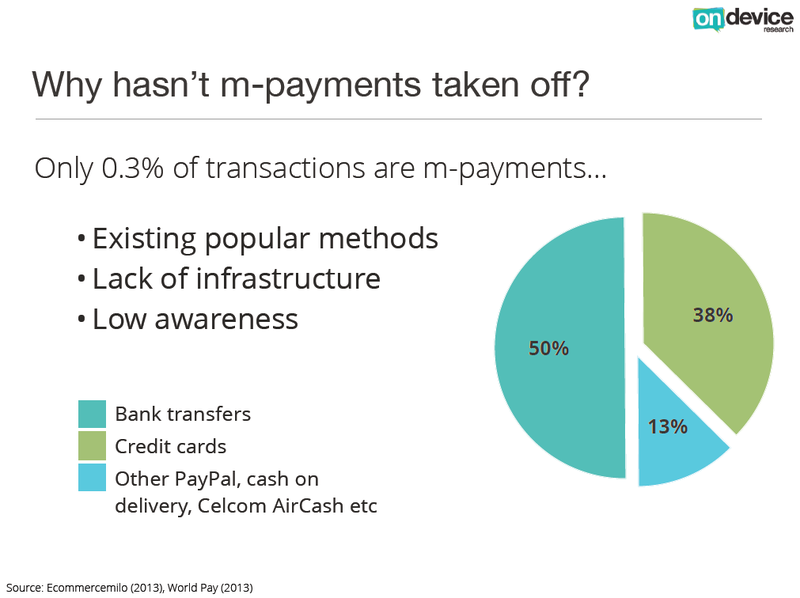 According to World Pay, only 0.3% of transactions are m-payments, which by definition (should be) specialized payment services like M-money.